Legendary wrestling bad boy 'Rowdy' Roddy Piper dies at 61. 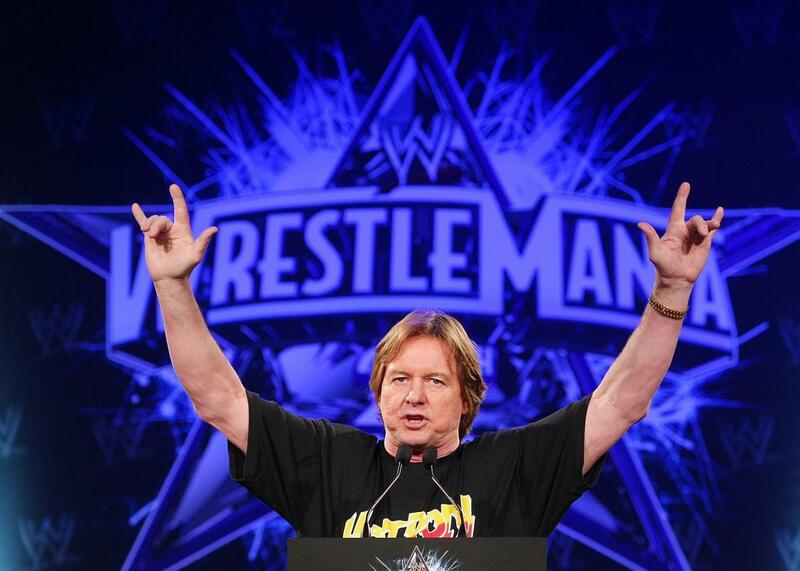 Roddy Piper attends the WrestleMania 25th anniversary press conference at the Hard Rock Cafe on March 31, 2009 in New York City. The kilt-wearing, trash-talking fighter who wrestling fans loved to hate died on Friday at 61. Roddy Piper, whose real name was Roderick George Toombs, died “peacefully in his sleep,” his agent tells the Los Angeles Times. The cause of death is unclear. Although he had been diagnosed with Hodgkins Lymphoma in 2006, Piper said last year he was cancer free. “He was in great health as far as I knew,” his agent said. Piper, one of the biggest stars in the wrestling circuit in the mid-1980s, won more than 30 titles in his career and was inducted into wrestling’s WWE Hall of Fame in 2005. He also acted in several movies, including John Carpenter’s cult classic They Live. Although he was Canadian, Piper played up on his supposed Scottish heritage by often wearing kilts outside of the ring and playing the bagpipes. For years, Piper was Hulk Hogan’s perennial rival and the two headlined some of the biggest matches during the wrestling’s heyday in the 1980s. In one of the legendary matches, Hogan and Mr. T beat Piper and Paul Orndorff on March 31, 1985 in what was the first WrestleMania at Madison Square Garden, notes the Associated Press. In one of the most memorable scenes of his career, Piper cracked a coconut over the head of Jimmy “Superfly” Snuka and later rubbed a banana in his face. Piper also played up a strong rivalry with Cindy Lauper, who was an ally of Hulk Hogan, and even kicked her on the head as part of a scene. Lauper took to Twitter to remember Piper. I am so sad to tweet that my friend Roddy Piper passed away last night. He was really such a sweet man. My heart is with his family. Hogan, who was fired by the WWE only days ago, called Piper his “best friend” and “a legend,” reports CNN. RIP Rowdy Roddy Piper! What a competitor?! I was honored to be your opponent in the first Wrestlemania. Bless You My Brother.